Also in 1957, during the International Geophysical Year (IGY), the USSR lofted the first artificial Earth satellite (Sputnik I) into low Earth orbit. Suddenly the focus was on catching up, and the space flight centered on vertical launch, expendable rockets and the experimental aircraft experience and capability were discarded. The USSR adapted a military intercontinental ballistic missile, the SS-6 Sapwood, to be the first launcher [Clark, 1988]. That launcher had the growth potential to become the current, routinely launched Soyuz launcher. The first Sputnik weighed 150 kg, while the payload capability of the launcher was about 1,500 kg. This is launch margin! The President of the United States rejected the suggestions coming from many sides to adapt military ballistic missiles, and insisted on developing a launcher sized specifically for the IGY satellite; that launcher, Vanguard, had almost no margin or growth potential. There was about a 4-kg margin for the payload weight. After a series of failures, the first United States Army military IRBM, the Jupiter missile, was modified into a satellite launcher and Explorer I was successfully launched. Since then, the former USSR, Russia, and all the other launcher-capable nations have focused on expendable launchers with the same strategy in ballistic missile utilization, that is they are launched for the first, last and only time. As discussed in Chapter 1, during the 1960s there was an enthusiasm to reach space together with a very intense effort to obtain the necessary hardware. Technical developments were ambitious yet technically sound and based on available or adapted/modified industrial capability. The difficulty was that the most capable vehicle configuration development, system designs, boosters and spacecraft were associated with a military establishment, primarily the US Air Force. 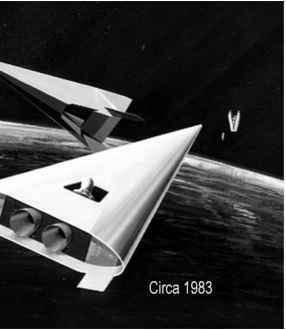 One goal was to have an on-demand global surveillance with either a hypersonic glider with an Earth circumference range capability or a hypersonic cruise vehicle with a half-Earth circumference range capability. Another goal was to establish a manned orbital laboratory to assure a human presence in space and enable space-based research and earth/space observations. The spacecraft launchers proposed had the capability for frequent scheduled flights to support an orbital station with a 21 to 27 crew complement, crewmembers being on six months rotating assignments. With the government's decision that space is not to be military but civilian, a civilian space organization must develop its own hardware and cannot use military hardware. Unfortunately most of the very successful system design efforts by the military organizations were discarded by the civilian organizations, with the result that the civil system never achieved the performance capability offered by the military systems. Before the Saturn V/Apollo Moon missions, the Apollo-Soyuz rendezvous and the short-lived Skylab experiment, the United States did have a dream to establish a space infrastructure and operational space systems. With the demise of the Apollo program and the elimination of the Saturn V heavy lift capability in view of a future, yet to be realized vehicle, there followed a 12-year period in which no crewed space missions were conducted, as all waited for the Space Shuttle to enter into operation. The dreamers, engineers, scientists and managers alike, with visions of future possibilities, were put indefinitely on hold; the subsequent developments became myopic and focused on day-to-day activities requiring decades in development, and larger and longer funding profiles for minimal performance improvements. Armies of paper-tracking bureaucrats replaced small, dedicated, proficient teams.